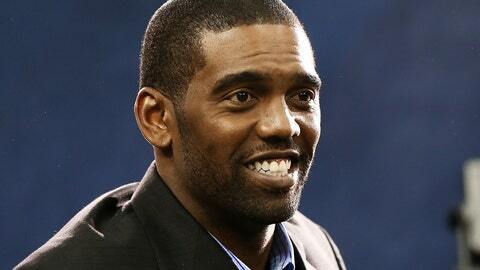 Randy Moss, now an NFL analyst for FOX Sports, was an all-time wide receiver talent. Ask around recruiting circles, and the stories of “Randy Moss, high school football player” are legendary. Former Florida State coach Bobby Bowden once told Sports Illustrated that Moss was the only player he ever saw who had the same athletic gifts as Deion Sanders (and in a much larger body). Lou Holtz, who won a national championship at Notre Dame, called Moss one of the best high school football players he’d ever seen. Yet ironically, when reflecting back on his time being recruited, Moss’ earliest memories of Holtz and Notre Dame were of disappointment. “I think mine came the next day,” he said with a laugh. From there, the recruiting chase was on, with just about every school in the country entering the race for not only the nation’s best wide receiver, but one of the most talented college football has seen. Only after a teammate told Moss he’d have to give a verbal commitment to the school to get a free trip did he cross the Warriors off his list. In the end, quite a few schools were crossed off by the person who was really calling the shots: Moss’ mother. She’d gone through the process a few years earlier with Moss’ older brother Eric (who later played at Ohio State) and wasn’t going to put up with the same never-ending parade of college coaches with Randy. Those three lucky suitors were Florida, Tennessee and Notre Dame, and Moss began to sort through them. Ultimately, Moss said, Florida was just too far from home. So what about Tennessee? Moss never forgot that moment even though he also passed on Tennessee and wouldn’t reconnect with Manning until a few years later. Looking back, Moss’s final decision wasn’t really a decision at all. From the moment that first questionnaire arrived, Moss was intrigued by Notre Dame. It might be hard for a younger generation of fans to imagine now, but Notre Dame was the “cool” school at the time and home to the coolest players, with guys like Rocket Ismail, Jerome Bettis and Tim Brown wearing those gold helmets. Add in the fact the Irish were on TV every weekend, stressed academics more than other schools and were coached by an icon in Holtz, and it was a no-brainer to listen when Notre Dame called. That was certainly the case for Moss. Even before Holtz ever made an appearance at Moss’ home in West Virginia, the receiver longed for playing in South Bend, Ind. Less than a week later, Holtz did indeed make that call before arriving for an in-home visit shortly thereafter. As history played out, Moss would never suit up for Notre Dame. Off-field issues spoiled opportunities at Notre Dame and Florida State, but Moss ultimately made good by becoming a record-setting receiver at Marshall, a first-round pick in the 1998 NFL Draft and a seven-time Pro Bowler. Moss thinks back to his recruiting process and how things have changed since — he noted the national rise of schools like Oregon — and wonders how things might be different if he went through it today. Ultimately, that young love for Notre Dame and his infatuation with the lore of the Fighting Irish, has never left Moss. Aaron Torres is a show writer for Fox Sports Live and a contributor to FoxSports.com. Follow him on Twitter @Aaron_Torres or e-mail at ATorres00@gmail.com.